Phoenix Sky Harbor International Airport started out in the 1930s with a single runway. Back then, PHX was nicknamed “The Farm” because of its isolated rural location. When the city paid $100,000 for the 285-acre airport in 1935, no one predicted that 80 years later, the airport would be in the middle of the Phoenix metropolitan area, encompassing multiple modern terminals and servicing more than 40 million passengers every year. The largest terminal at PHX is Terminal 4. There are a total of seven concourses in T4, which serves as the Phoenix home to US Airways/American Airlines, Southwest, Air Canada, British Airways and WestJet. 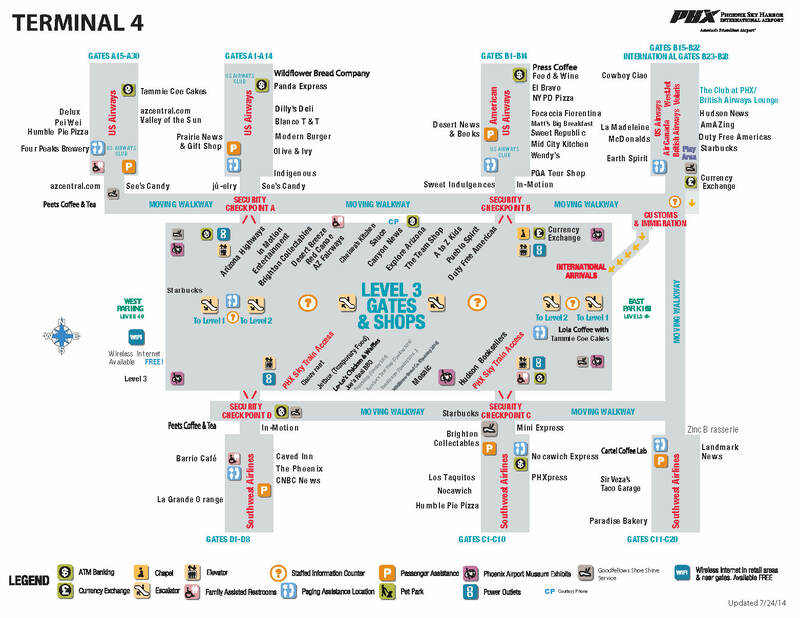 Due to its size and the fact that it serves more than 80% of all Phoenix passengers, nearly all of the amenities are located in T4. One of the best ways to relax between flights is to head to a nearby lounge. 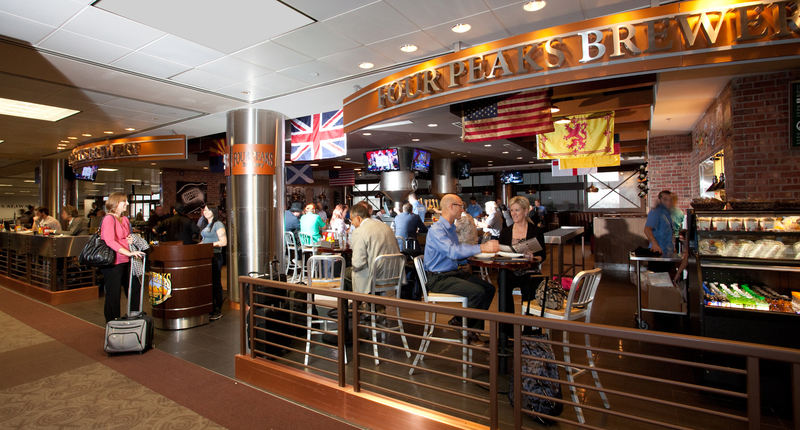 There are several lounges in PHX T4: three US Airways/American Club Lounges, a British Airways Club Lounge and an independent The Club at PHX. The three US Airways Clubs will become Admirals Club lounges in coming months as a result of the US Airways/American Airlines merger. There is one above gates A7 ad A9 (open 6 am to 11:30 pm); one between gates A19 and A21 (open 6 am to 8 pm); and the largest and newly remodeled lounge above gates B5 and B7 (open 6 am to midnight). All three lounges offer free Wi-Fi; wireless printing; snacks; water, coffee, tea and soft drinks; premium beer, wine and spirits; conference rooms; TVs; newspapers and magazines. 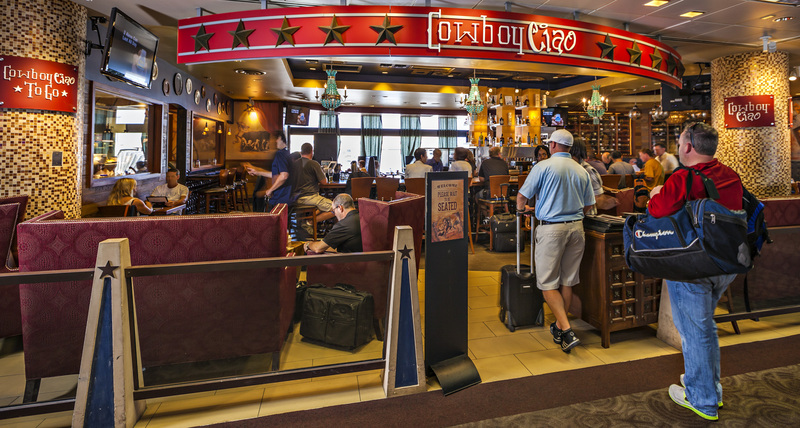 The lounges are open to those who hold a US Airways Club membership, an American Airlines Admirals Club membership or to anyone who wants to pay the $50 daily charge to use the facilities. The British Airways Club is located at the end of the B concourse, above Gate B22. If you have Oneworld Emerald or Sapphire status or are traveling on a First or Business Class ticket on any Oneworld airline, you may visit the British Airways lounge. The club is open 24 hours and offers free Wi-Fi; water, coffee, tea and soft drinks; wine and spirits; TVs; magazines and newspapers. There are two different lounges for first class and business class and views of the tarmac. There is also one independent lounge at PHX: The Club at PHX. This lounge, located between gates B21 and B23, is accessible to passengers on any airlines by paying a $35 one-day access fee. The lounge offers floor-to-ceiling windows with views of the tarmac. There is Wi-Fi; work stations with PCs; snacks and drinks; wine and beer; newspapers and magazines; and TVs. Tammie Coe Cakes: try the butterscotch crumb buns or any of the big, soft cookies. Four Peaks Brewery: for a sip of a local favorite brew, try the Kilt Lifter beer. Blanco Tacos + Tequila: local restaurateur Sam Fox serves up amazing guacamole, machaca tacos with braised short rib and refreshing margaritas and sangria. Press Coffee Food & Wine: this locally roasted coffee makes a great cup of Joe. Sweet Republic: all natural, hand crafted ice cream; you must try the salted butter caramel. Matt’s Big Breakfast: serves breakfast and lunch made with local organic produce and cage-free eggs; try the cheese omelet. Cowboy Ciao: has been a local favorite for almost 20 years, serving Italian, Mexican and Southwestern dishes; the Stetson chopped salad is an unforgettable meal. Zinc Brasserie: a smaller version of Zinc Bistro, this local favorite serves up amazing mac and cheese with ham. Humble Pie Pizza: great pastas and salads (check out the Caprese) but the white pies are amazing (who can resist fig and prosciutto with goat cheese?). Barrio Café: started as a neighborhood Mexican food joint with elevated food; try the camaron (shrimp) enchiladas with Oaxaca and chèvre cheese. La Grande Orange: this is a local grocery store/pizzeria/sandwich shop that serves amazing pizza but even more amazing chocolate chip sea salt cookies. Chelsea’s Kitchen: the sit-down restaurant affiliated with La Grande Orange (don’t forget the cookies for dessert). Cheuvront Restaurant and Wine Bar: this used to be a downtown Phoenix staple, but its airport location is the city’s only location for this super cool wine bar; sip a glass of wine or champagne, nibble on the cheese plate or try the ancho pork empanadas in a flaky puff pastry. Of course, there are still those kiosks selling cheap scarves and those newsstands with water, soda, chips and magazines, but Phoenix Sky Harbor International Airport is also home to several high-end shops. One of the best is Mosaic: Fine Art & Craft Gallery. Mosaic, located in the T4 lobby before security, features beautiful art glass, sculptures, jewelry, paintings and ceramics. Alongside work by local artisans are fine works by world-renowned artists. Don’t miss the art books, paper goods and small gifts at the back of the shop. Don’t want to carry it on your flight? No worries. Mosaic will ship for you. Inside security, next to gate A3, is Mosaic’s sister store, Indigenous. This shop features Native American arts, crafts and jewelry. From traditional Native American pottery, baskets, Kachina dolls and weaving to contemporary jewelry using Arizona’s native turquoise, Indigenous has an eclectic assortment of gifts. Your family and friends will never know you found their treasure at an airport. Most of us take for granted the works of art on display at airports around the world. Phoenix Sky Harbor International Airport is no exception. In fact, the Phoenix Airport Museum is one of the largest airport museums in the country, with nearly 600 pieces in the collection, along with many others on loan from other museums or collections. On average, collections change every six months and are on display 24 hours a day for travelers. 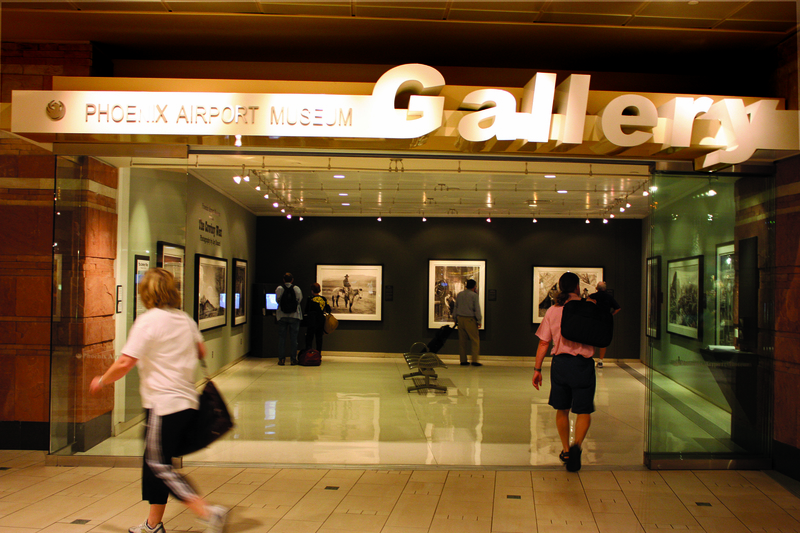 Artwork includes a variety of mediums, artistic styles and disciplines, and can be seen in all terminals as well as the rental car center and Sky Train terminal. One of the most iconic displays at PHX is a series of photographs of 100 Arizona ranchers taken by local photographer Scott Baxter in 2012 in honor of Arizona’s Centennial. Those photographs can be seen in T4’s International Walkway. There are two locations currently hosting an exhibit scheduled to run through early 2015 that focus on the 7 C’s of Arizona: Copper, Cattle, Cotton, Citrus, Climate, Cactus, Canyons. In this exhibit, various artists use, depict and/or reference the C’s in their artwork. There are eight display cases at the east and west ends of Level 3 in T4 that will be on display through February 15, 2015. The gallery on the south side and in the center of T4’s Level 3 will have this art on display through April 19, 2015. If you have a bit longer for your layover, you can go outside the terminal and catch a bus to the nearby Rental Car Center. The most eye-catching display is the installation piece Crosstitch by Ed Carpenter. The building has a series of skylights that work with walls and ledges to create canyon-like spaces. Carpenter installed dichroic glass—glass coated with a thin layer of metallic oxides that transmit certain light wavelengths while reflecting others. The resulting iridescent effect changes each time you visit the building, depending on time of day, sunshine, clouds and weather conditions. In addition to this major installation, there are four hallways off the massive lobby with a diverse art collection. Prints, paintings, photographs and fiber art from Arizona artists are on display. You can download a self-guided tour of the artwork at the Rental Car Center. Airports are more in tune these days with the needs of travelers who want to stay healthy despite a grueling schedule. To help with that demand for healthy alternatives, PHX created the FiTPHX Airport Fitness Trail. The trail is inside security and you can follow it, using the downloadable map here to walk the terminals. Along the way, the map outlines several key points of interest that show off breathtaking Arizona landscapes. If you start at the end of the A17 to A30 concourse, stop at gate A28 for a view of the downtown Phoenix skyline. Continue up the A concourse and at Peets Coffee and Tea, catch a peek of the Phoenix FAA Tower. This is the newest tower at PHX. The original PHX control tower was constructed in the 1950’s from underground fuel storage tanks welded together. The center contained a 1.5-foot-wide pipe that held all wiring and a 129-step spiral staircase. Continue down the moving sidewalk toward gates A1 to A16. Look to your left and catch a peek of Piestewa Peak, a favorite hiking place in winter months. Walk past the A1 to A16 gates toward the B concourse. About halfway down, look to your left again to catch a view of the iconic Camelback Mountain. If you have time to stroll down the B15 to B28 concourse, check out the view from B27 of The Buttes at Papago Park, which is home to the Phoenix Zoo and Desert Botanic Gardens. Continue on toward the C concourse. About halfway between B15 and C11, you can get another look at The Buttes at Papago Park. Turn and continue toward Gates C1 to C10. About halfway down the moving sidewalk, you can see South Mountain Park Preserve. It’s easy to spot with an assortment of antennae on top. Continue past the C Concourse toward D gates. About halfway down, you can get another look at South Mountain. Turn to walk down D Concourse. At the end, between gates D7 and D8, you can check out the Arizona Air National Guard headquarters. All photos courtesy Phoenix Sky Harbor International Airport.